Big and sweeping, spanning the refined palaces of Osfrid to the gold dust and untamed forests of Adoria, The Glittering Courttells the story of Adelaide, an Osfridian countess who poses as her servant to escape an arranged marriage and start a new life in Adoria, the New World. But to do that, she must join the Glittering Court. But no complication will prove quite as daunting as the potent attraction simmering between Adelaide and Cedric. An attraction that, if acted on, would scandalize the Glittering Court and make them both outcasts in wild, vastly uncharted lands. . .
Why am I waiting? I loved Vampire Academy so I'm down for a new series by this author! The comical, fantastical, romantical, (not) entirely true story of Lady Jane Grey. 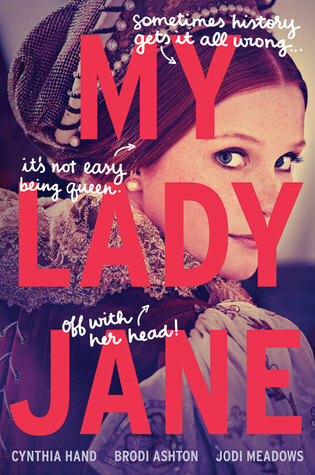 In My Lady Jane,coauthors Cynthia Hand, Brodi Ashton, and Jodi Meadows have created a one-of-a-kind fantasy in the tradition of The Princess Bride, featuring a reluctant king, an even more reluctant queen, a noble steed, and only a passing resemblance to actual history—because sometimes history needs a little help. At sixteen, Lady Jane Grey is about to be married off to a stranger and caught up in a conspiracy to rob her cousin, King Edward, of his throne. But those trifling problems aren’t for Jane to worry about.Jane gets to be Queen of England. Why am I waiting? I've had my eye on this one for a WHILE now. Ever since March when Jodi Meadows and Brodi Ashton had a signing in Austin and talked about this---making it sound so cool and funny and just plain fantastic. Therefore, I want this book in my hands. So excited to read!!! Ooh nice! I'm excited for The Glittering Court as well! Love Richelle's books! I so so so want Glittering Court. I haven't read the released chapters yet cause that would be torture. My Lady Jane looks good. These both sound great! Thanks for introducing me to them! Happy reading! My Lady Jane is my pick this week as well! I am interested in Glittering Court as well, although I have yet to read the author. Great pick! Ooh, The Glittering Court sounds so good!! My Lady Jane also seems like a fun read :D Thanks for sharing! I cannot wait to get my hands on The Glittering Court! It sounds so amazing. Awesome picks!